At any time after creating a project (see Creating a Project), you can change the configuration of the project, including the project coordinate reference system (CRS), latitude/longitude display datum, the seismic reference datum and the backup settings. Click Open Project and select a project that you want to configure. Click the Configure Project spanner icon. The Configure Project window will be displayed. Alternatively, if you have already launched a project, open the File menu in the Control Panel and select Configure Project. Note: If the project is currently open in Insight, a restart is required for the changes to take effect. In the Project Coordinate Reference System section, click Select CRS to change the coordinate reference system (CRS) for the project. The Select CRS window will be displayed. If you did not specify a project CRS, you can select to use metres, International feet, or US survey feet as the X/Y Unit for the project. Note: You can use the X/Y Unit defined for the project as the preferred display unit in Insight (see View Preferences). Insight displays Depth values using the same units as the X, Y unit. Select CRS Not Specified if you do not want to select a coordinate reference system. In this case, you will not be able to perform coordinate conversions or view latitude/longitudes in this project. If you choose Selected from Standard CRS Table, you can then select a CRS from the table. Type your preferred CRS in the Search (regex) bar and the table will automatically filter accordingly. To read more about a particular CRS, select that CRS and click Details at the top right of the window to open a website with more information. When you have finished selecting the CRS, click OK. If you have specified a project CRS, then you can also change the datum for latitude/longitude conversions (lat/long will not be available if no Project CRS is selected). 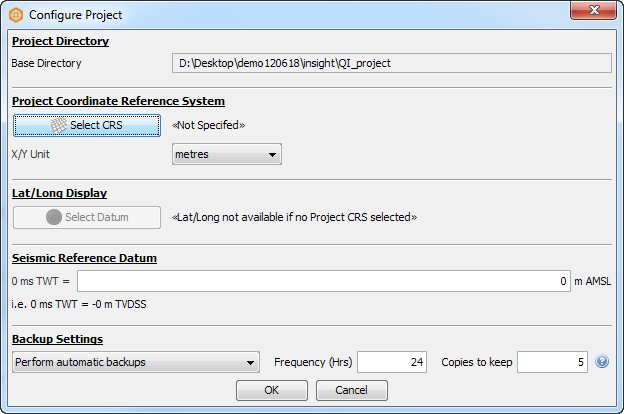 Click on Select Datum to open the Select Lat/Long Reference CRS window. Select Use WGS84 or select an alternative datum from the table. Once you have selected a latitude/longitude datum for the project CRS, you can configure the display of the latitude/longitude grids and information in the Map View. In the Seismic Reference Datum section, you can change the value of the project-wide non-zero seismic reference datum (AMSL). The project SRD applies when converting data from TWT to TVD. Note, the SRD should be set when first creating a project, the data is not automatically updated if the SRD is changed later. Data must be reloaded for the SRD to take effect. This operation backs up the .dugprj database file. Horizons, volumes, TIFFs, etc, are NOT contained within the database. Please ensure that you create full, regular backups of the Insight project. This can be arranged separately or using our backup tool in the Data Manager (available in the Data Manager module, see Backup a Project Database). Select Perform automatic backups in the Backup Settings section to allow Insight to create backups of the project database. Input the number of hours that must pass for Insight to create a new backup and the number of copies you want the system to keep before deleting older copies. When you are satisfied with your settings, click OK to save your project configuration. For more information on backing up your project, see How should I backup my project? in the FAQ section. It is NOT safe to simply copy the database file manually because if other users are logged in and modifying the project while the backup is done, the backup will fail because the copied database file will be corrupted. What this automatic backup does is to check if there are other users logged in (an "integrity check"), and locks the project from being modified while it backs up the project database to a backup folder. At every start-up of the project, Insight will automatically check if the required hours have passed to create a backup. It it has, then it will create one. 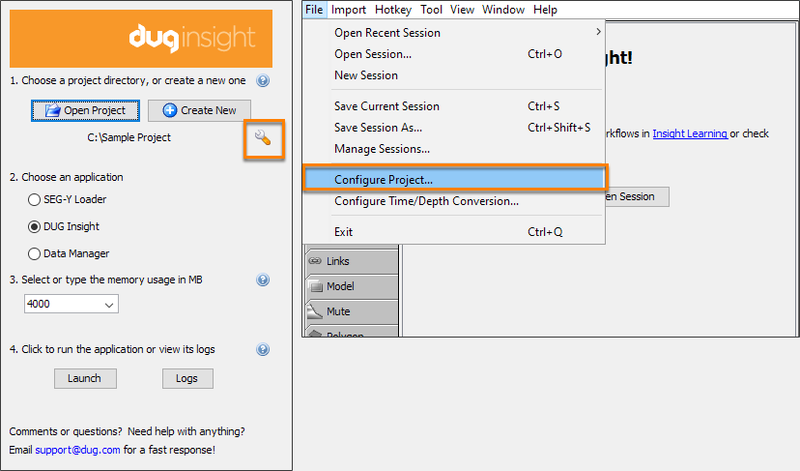 In Insight 3.1, if your database is corrupted, Insight will disable access to the database until the project is fixed. This is to prevent any further database corruption, and prevent Insight from generating backups of the corrupted project. If your database is corrupted, please consult our support team at support@dugeo.com. You might be required to send diagnostic logs of your project session to help us understand why it is happening (see Viewing and Sending Diagnostic Logs). The automatic backups configured here should not be confused with session autosaves. Autosaves record the session (not the project), and occur once every 5 minutes. Only one autosave is available per session as each new autosave overwrites the previous one. As soon as the session is manually saved on closing, the last autosave is discarded (see Autosaves). In contrast, the Automatic Backup creates and keeps a number of copies of the project database (as defined by the user) at a user-defined frequency.